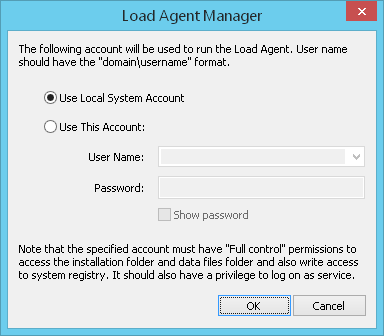 Load Agent is installed as a Windows service on your system. During the installation you specify the settings for setup and correct work of Load Agent. If you need to change these settings later, run the Load Agent Manager and make the necessary changes. 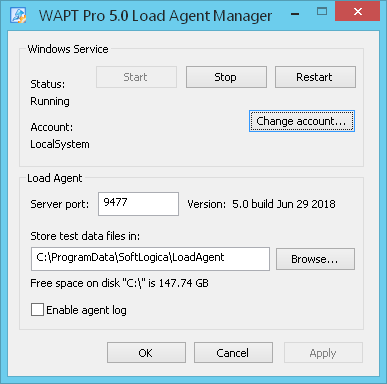 Enter the Windows Start menu, choose SoftLogica in the list of currently installed programs and select WAPT Pro -> Load Agent Manager. You will see the window of Load Agent Manager. Status: Here you can view the current state of Load Agent service and also manage its state using the Start, Stop or Restart buttons. Account: Click the Change account... button to change the account for the Load Agent service. You will see the following dialog. Here you can specify another account for the Load Agent service. You can choose the Local System account or provide a username and password for any other one. Account name should have the domain\username format. Note that the specified account must have the "Full control" permission to access the installation folder and data files folder and also write access to system registry. It should also have a privilege to log on as a service. If you choose Use This Account option, you will see the list of user accounts created on your computer in the User Name combo-box. You can either select any user in the list, or enter another user name. You can check the Show password option to see what you are typing in the Password field. Server port: WAPT Pro Workplace uses this port number to search for Load Agents in the Local Area Network and to establish connections to them. You can change the default value of port number. Here you can also see the version of currently running Load Agent. Store test data files in: Here you can change the default location for users' logs (saved on the computer running Load Agent) and also for various files required during test runs (for example, SSL certificate, a file for $LOrder function and others). Enable agent log: This option allows generating agent log which contains information about the work of Load Agent. Agent log filename is LoadAgent#9475.log (9475 is the server port number). It is saved on the computer running Load Agent in the same folder with the users' logs (this folder is defined by the previous option Store test data files in). Note that any changes made in Load Agent Manager will be applied only after you restart the Load Agent service (click the Restart button).